This is a good-looking, smart log cabin in the alpine style. It has a lot of features that will make it the perfect place for entertaining. On the build quality side, there is tongue and groove work in the roof, walls and flooring. This brings you a very strong building that is reassuringly solid and weighty. There’s also that watertight aspect that tongue and groove delivers too. One key aspect here that really brings a level of customisation to things is the option to choose the thickness of your flooring. Tongue and groove is exceptional in the first place, but when you get the choice of thickness, it makes for real value. There are two windows that are of a good size, and bring in plenty of light. These have styrene in them for safety and extra clarity. They also open up so you can benefit from quick and easy ventilation. It’s a perfect building for relaxing in, and if we were to pick any holes in the package we would ask for a pre-treatment to be applied at the factory. This would have been the icing on the cake. 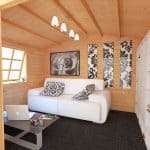 That said, it is a large cabin that has lots of potential for fun, lazy evenings in the summer. 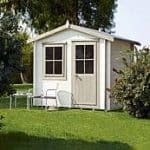 This is a useful building if you need to move on from a simple garden shed and take on a larger building that could be used for more than one purpose. 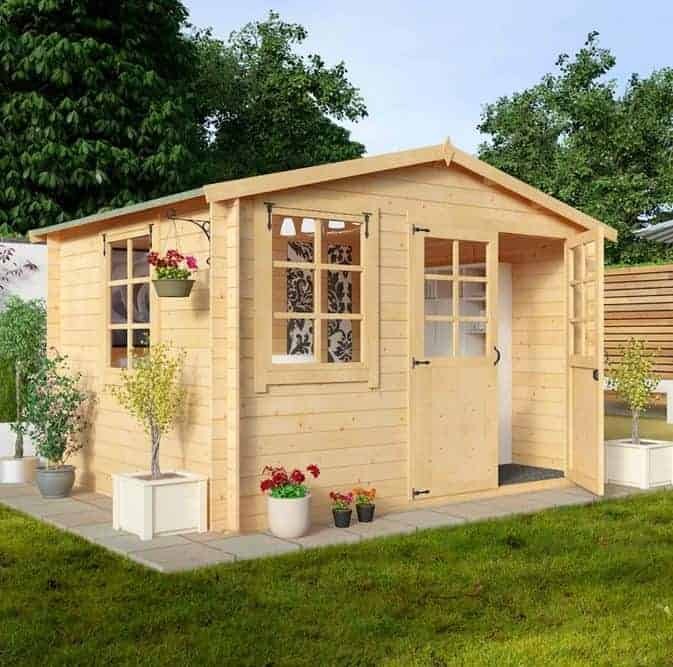 For example, you may want storage space, but also a conservatory space at the same time. This building is versatile enough to handle that, and we saw some excellent features that should make it a good purchase. The width of the building is 324.6 cm and the depth is 265.6 cm. This means you get a good size building, which allows for relaxing on a sunny afternoon, as well as the storage of a few items from around the garden. 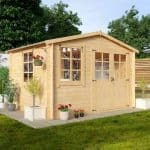 The roof is tough and sturdy, which is what you’d expect on a building this size and at this price. You also have a pleasant little overhang, which makes it that little bit more attractive. On a practical note, there is some protection from rain, as well as some shade due to this feature. 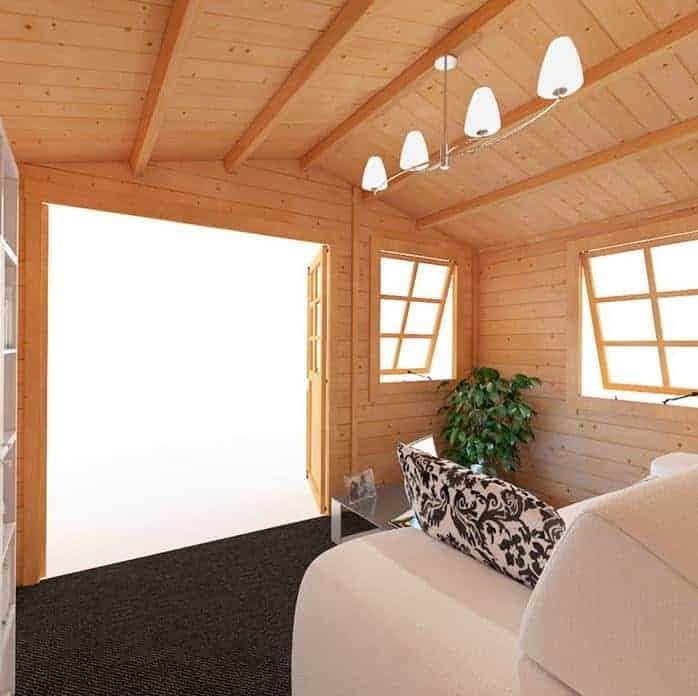 If you’re using this as a place to entertain friends, this overhang and the space inside the cabin make for a very pleasant setting, perfect for summer drinks. This is a big building and it is protected by some excellent tongue and groove cladding. 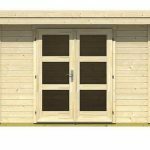 You get a lot for your money here, because the timber interlocks, which gives you a watertight, tough exterior. This helps with wear and tear so you have less to worry about as the years go by. You also have the added advantage of a smooth, attractive outer wall. 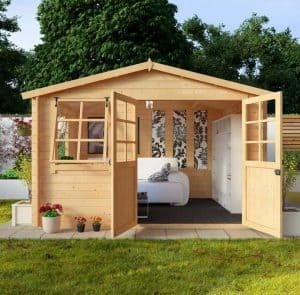 The timber is 19 mm thick, which will be much thicker than what you’re used to if you’ve graduated from a standard garden shed. You need solidity underfoot as well, and there are choices here. You can opt for the standard tongue and groove floor that is 11mm thick or the premium model, at 19 mm. We think both are excellent, but if you want to maximise your usage, go for the 19 mm. It just means that you have the strongest floor surface, which is useful if you have a lot of foot traffic. This is where we were actually quite surprised. The cabin comes completely untreated, so you will have to treat the building before you erect it. We would have liked to have seen a pre-treatment being applied at the factory, considering the price of the building, not to mention the size. It isn’t that difficult to apply a treatment, and you do need one. Not having one means your building will suffer wear and tear within a year. You’ll find a treatment at your local DIY centre, and we recommend buying the best you can find. It is important to keep a building ventilated, especially in those summer months, and this unit comes with two opening windows. Some cabins don’t, and with these you have to rely on opening the door for air. The windows are glazed with styrene, which is stronger than normal glass, and also shatterproof. The windows are 88.2 cm in height, so there is plenty of light there. And that styrene really helps in this regard, because the material is clearer than glass. This is a large building, and you’ll naturally want to protect what is inside. There is no lock supplied, so this means you’ll have to find a padlock that will bring that level of protection required. We recommend a padbolt option, and you can easily find these in DIY shops. You should go for a tough one that matches the size of the building. 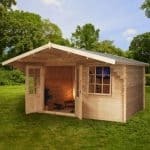 When you buy a shed or a log cabin, there are often customisation options that allow you to get even more value from the purchase. 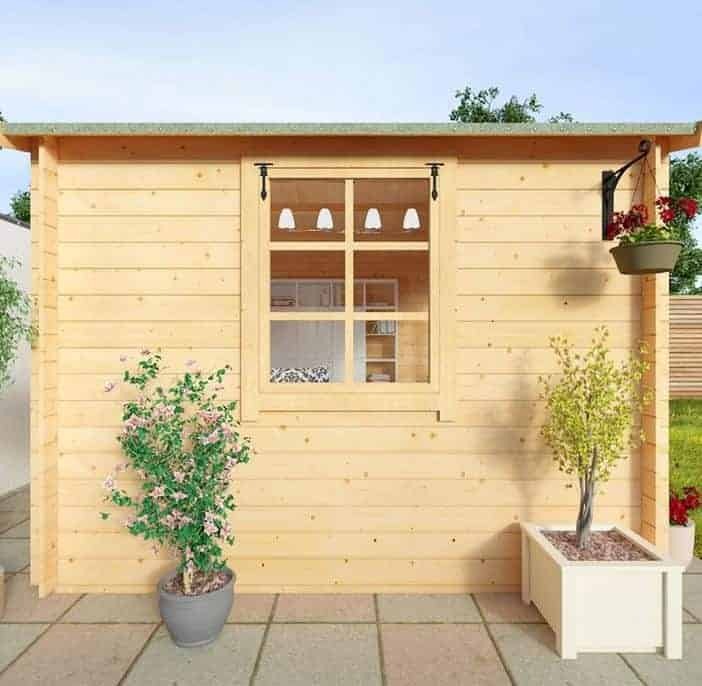 BillyOh haven’t offered a lot with this cabin, and that’s mainly because you get a lot of solid features with the standard building. However, there is the opportunity to choose the colours for your building. We liked the range of colours here, and we recommend that you opt for a trim color at the very least. This really livens up the building. If you go for a wall paint, you’ll be pleased with the overall effect, because that tongue and groove cladding is smooth and very easy to paint. The end result is stunning. Tongue and groove is a real mark of quality, and the fact it features so heavily in this building give you peace of mind. The timber is locked together, giving more weight and a watertight structure. The overall build quality is excellent. We really expected to see a pre-treatment here, one that would keep the building safe for years. However, this is not the case, but as long as you treat it as soon as you take delivery, and then annually, you should be fine. The built-in tongue and groove goes a long way to keeping it tough and durable. Plenty of room in here, and this is helped even more by the extra head height granted by the apex roof. 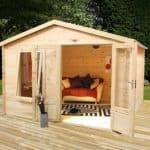 This is a log cabin with heavy tongue and groove boards included, so you’ll need a couple of people with DIY skills to get it installed. We reckon it will take you a day. 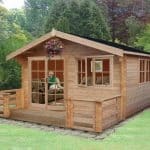 Apart from the lack of a pre-treatment, there is a strong, solid log cabin here that should give you years of usage. 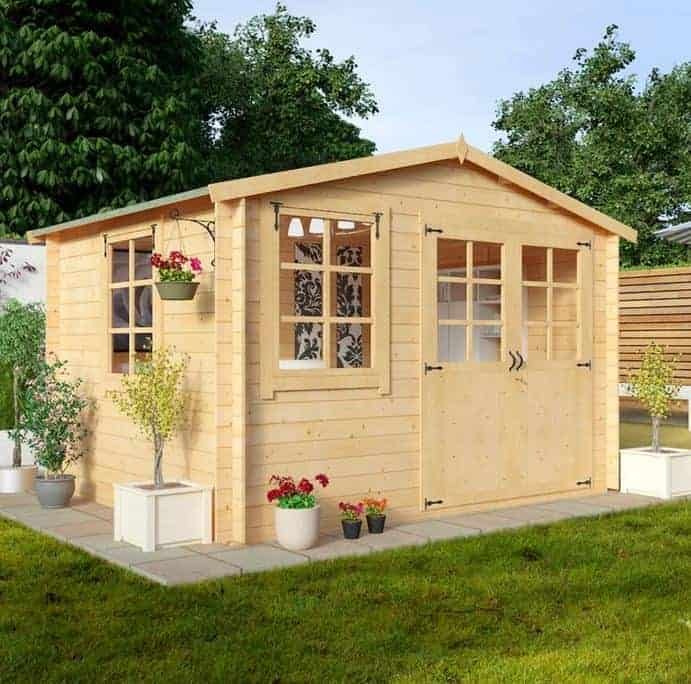 Final Thoughts: If you’re the type of person who embraces summer and loves entertaining in the garden, this log cabin is perfect for you. It is a good size, and it allow you to store items as well as use it for relaxing in. We liked the tongue and groove work (it was especially pleasing to see it in the roof) and felt that this added a lot to the overall value of the building. The log cabin is satisfyingly heavy as you walk around in it and that cladding really helps with this. We also liked the windows and the smart little overhang that gives the building that pleasant alpine style.